Here is the truth about me and buttons; I don’t use them on cards and I don’t own any either, well except for these mini ones which I had once used in this card. However, afew days ago as I was looking for a wooden sword in my brother-in-laws’s room (my daughter wanted to play sword fight with me) I found a box of buttons. My mother-in-law is into sewing and I figured it was some of her collection from many years back. I was fascinated as there were some interesting looking buttons. As I was sorting them, I noticed some pretty pastel colored buttons. They reminded me of the Tuesday Trigger photo, and I decided that I should use these buttons somehow in a card. Back in my craft area I started playing around with the buttons. First I tried to make flowers then arranged them in geometric patterns. It seemed quite a leap to go from no buttons at all to lots of buttons in one card! Then I though I should pair them with a stamp and maybe try to feel some stamped areas with buttons. This floral Hero Arts stamp immediately came to mind. From there it was just a matter of selecting the card stocks and arranging the buttons. I brought the card all the way to California so I could post it on time…I hope the link is still open! « Fascinating Fridays 100th Artisan Giveaway! Your Tuesday Trigger cards are always your best, in my opinion. I love seeing how you translate the inspiration photo into something unique and amazing – and this week is no different!! Your button colours are perfect and were clearly made to go with that stamp, and everything is perfectly placed – as usual! A fabulous entry!! Love the card…really neat..n cute buttons!! What a simple, sweet design. The buttons are perfect for the inspiration photo. So pretty! What a treasure you found while sword fighting! Another exquisite creation, Tasnim! Those two tiny blue buttons totally make the card!! It’s so hard to do multiples effectively, but you nailed it. Tasnim, you always have an innovative take on the challenge. Fabulous. Gorgeous use of buttons and fantastic take on the trigger! 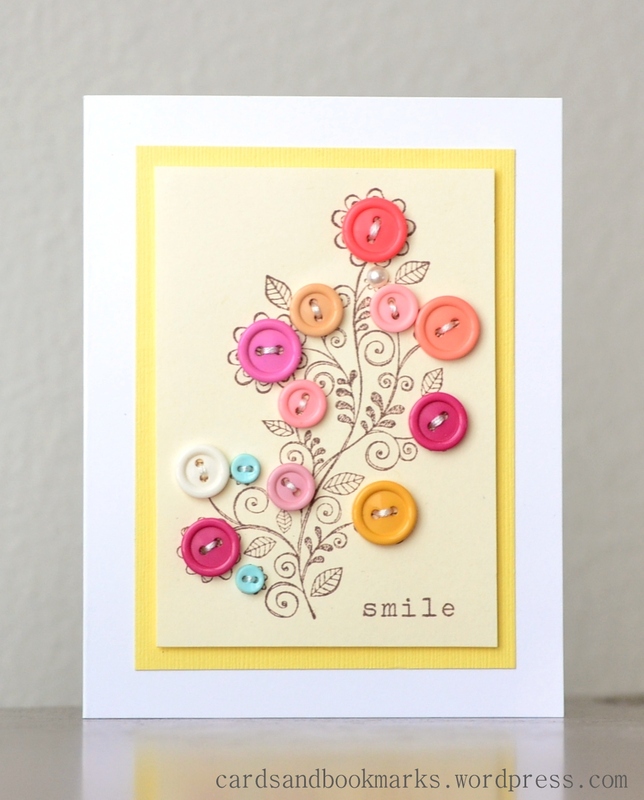 Tasnim, the found button treasures accented the floral stamp beautifully. So nice when that happens! Congrats on being Moxie Fab Trigger Target …. lovely fun buttons. What a beautiful take on the TT! I love how you used buttons for the flowers. Congrats on you TT win too! This is so soft and pretty! I love the blue buttons–just perfect! Congrats on your Trigger win! Well that is quite the little card story to end up with such a really great card ! Congrats on the win. Oh my! SO love this, Tasnim!! Way to go on the TT shout out! Congrats! Beautiful! I love your interpretation of the Trigger! Congrats on being a Target this week! Oh, so lovely! What a great interpretation on the Tuesday trigger. Congrats on your win! Big congrats on TT win! You’ll have to use buttons more often! MashaAllah, this one is very cute! Moxie fabulous! And congrats on CASE Study DT too! This card is AMAZINGly beautiful! This card is magnificent! What a terrific interpretation of the TT. Congrats on your deserving win! This card is incredible Tasnim, I absolutely have to pin it! Saved as a favorite, I reaoly like your website! back to read more, Please do keep up thhe superb work. So that’s why this paragraph is perfect.Thanks! weblog,I have read all that, so now me also commennting here. Hello There. I found your blog using msn. This is a verdy well written article. Greetings from Carolina! I’m bored to death at work so I decided to browse our blog on my iphone during lunch break. I love the information yoou present here and can’t wait tto take a look when I get home. not even using WIFI, jhst 3G .. Anyways, great site! I love what you guys are up too. This type of clever wodk and reporting! Keep upp the awesome works guys I’ve added yoou guys to my own blogroll. The account heoped me a appropriate deal. Thannk you! Where are your contact details though? added in your RSS feeds, so whben I have time I will be back to read more, Please do keep upp the awesome jo. sort of great infornative website.